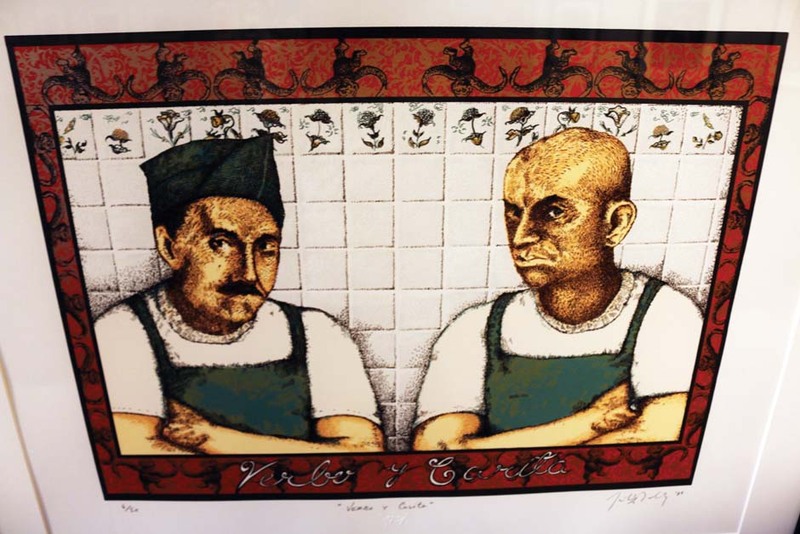 Forty serigraphs by Latino artists will remain on display until Friday, March 4, in the Inasmuch Foundation Gallery in the Visual and Performing Arts Center on campus. The exhibition has the main purpose of showing the beauty and the originality of the art pieces, said Lemuel Bardeguez, OCCC’s acting vice president for Community Development. Serigraphs are prints made by using a silkscreen process. In addition to its artistic value, the art show has another purpose: interested students can improve their Spanish language fluency thanks to the labels that go with the paintings, Bardeguez said. They include information about the artists’ lives and their art pieces. All of the art pieces were made by artists with Latin American backgrounds, Bardeguez said. Many of the serigraphs talk about identity and sense of place, and encourage audiences to ask questions about the nature of cross-cultural exchange. In this painting, the famous raisin girl is portrayed as a skeleton with a “guaranteed deportation” bracelet. Among the 39 artists there is one related to the state of Oklahoma. Jose Rodriguez, whose exhibited serigraph is called ‘Verbo y carita,’ was born in Venezuela in 1959, and studied at the University of Oklahoma in Norman, Bardeguez said. Nowadays Rodriguez lives in Oklahoma City. His piece of art portrays a Mexican idiom that means that people who are not good-looking (carita) need to attract other people who are good talkers (verbo). The image depicts two men seated side by side representing the two concepts. Patches of color accent the characters. The show is an Exhibits USA presentation, a national division of Mid-America Arts Alliance, with the Oklahoma Arts Council and the National Endowment for the Arts, according to its promotional material..
All of the serigraphs were made by artists during their residency in the studio of Latino artist Jose Coronado, a program that started in 1993. All of the “Estamos Aqui” serigraphs belong to a larger portfolio housed at University of Arkansas at Little Rock, Bardeguez said. The exhibition on campus can be visited from Monday to Thursday between 1 p.m. and 5 p.m. On Fridays the gallery is open by appointment. For more information, contact Bardeguez by email is lbardeguez@occc.edu.